It’s always a challenge to be the last person on a book blog tour, as everyone else has already said so many insightful things about the book or the author, but here is my take on this interesting book. I lectured in Personal Development and Mental Health Recovery for over 12 years, and so I can honestly say I have read and written a LOT of self-help articles, worksheets and books. 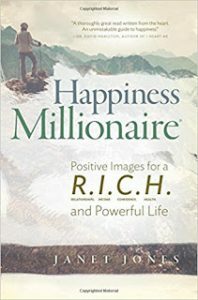 Happiness Millionaire covers many of the same ideas and angles, but with one genuine difference, and that is the emphasis put on the use of visual stimuli and our sense of wellbeing. Jones uses 13 images in her book, and has them in a pocket size version as well. These are discussed in the book and you are encouraged to use them for inspiration and to change the way your brain reacts over time. The book is very personal and Jones shares a number of very difficult situations she has faced in her life with great honesty and humour. It’s a very readable book, and has a warmth and friendliness that makes reading it very enjoyable, regardless of the main message. This accessibility makes it a real gem, as so many self-help books are written with a certain condescending tone and there is nothing of that here. I was not a big fan of many of the photos—but I do agree with the principles in the book, and if people are looking to make real and long lasting changes (which will take time and energy) then this book would be a brilliant place to start. I’m so glad I had a chance to read a copy of Happiness Millionaire as a member of The Book Collective, all views are my own.